Thursday, March 30, the GHS Marine Biology group converged on the little town of Layton, Fl located on Long Key. The ride was long for many in the group, roughly 28 hours. Some opted to drive themselves and others flew. But by 4:30 pm we were all here. According to Mr. Weaver, this is the largest group he has brought here to Layton. Below is the group statistics. That is a total of 164 people! About 30 more than previous years. Thank goodness that amount of people didn’t scare Mr. Weaver off. During the week students will be studying the marine life surrounding us as well as at the Coral Restoration Foundation and John Pennekamp State Park. Follow us on the website for details on our daily activities and to see photos located here. You can also follow our us on Twitter @GHSMarineBio, Facebook – GHS Marine Biology 43rd Year or Instagram -GHSMarineBio. This trip takes hours and hours of planning and requires many willing hands to make it successful prior to even arriving. Thanks to Carl Weaver and all of rest of you for allowing this 43rd year to commence. GCS additional notes: Another EL teacher, Hans Hess was also at the baseball game, along with Jen Eberly’s student teacher. Ms. Eberly also told Mrs. Immel that one of the two students/baseball players that she came to watch was new to Goshen Community Schools this year, and still has limited English. (His teammates were helping him by providing some translation of instructions from the coaches.) Ms. Eberly stated that the inclusion of her student on the baseball team has changed her student in class; that simply being involved and part of a team has increased his confidence. Thank you to Mrs. Immel for recognizing teachers who support our students every day, in so many ways. And thank you to the teachers, who sit in bleachers on cold, damp spring evenings in order for their students to know that they care about them, beyond the classroom. Goshen High School student, Brenda Macias, entered an essay into the My Favorite Teacher contest through Barnes and Noble. She shared about how GHS math teacher, Justin Grubbs, has influenced her life and why she admires and appreciates him. Her essay was chosen out of over 100 entries at the local Mishawaka store, and she won the contest! Brenda will receive a certificate of recognition, a gift card and gift basket, and will be honored at the Mishawaka store during a ceremony for the winning teacher. Mr. Grubbs will receive a plaque, a gift card and gift basket, and will be honored at the ceremony. There are five regional winners who will be entered into the national competition, from which the national winner will be chosen. Good luck Brenda, and congratulations on winning the local competition! And thank you, Mr. Grubbs, for providing a nurturing educational environment for your students! An Inspirer. En empowerer. An engager. These are characteristics that you demonstrate with all of your students, including me, every day. 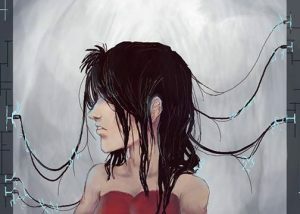 You make me feel supported when you say, “Please let me know how I can be helpful” and genuinely mean it. It’s always nice to be able to notice the excitement you show to learn with me rather than just teach me. You have inspired me to work for the future, empowered me to pass all of my classes, and engaged me to better myself. Thank you. You opened my eyes to what I could be and what I could do in a way that I never thought possible. You changed my whole aspect on my learning, I wouldn’t be where I am today without you. The majority of my brothers haven’t done well in school, even to the point where one has decided to drop out, and the other is so behind that it worries me if he will graduate on time. I think that it would have been a different outcome if they had known Mr. Grubbs. I never thought I could be good in math and whenever I struggled or began to get frustrated, I wanted to give up. Algebra 2 is said to be one of the hardest classes but I never had that feeling because you helped me to understand it. I am capable, but it will take hard work and dedication. My grades are looking better than ever. I have all A’s and B’s in all of my classes, which I’ve never had before. I know even more now that it doesn’t matter how slowly I go, as long as I do not stop. Sometimes I feel so so blessed and then I realize this is my reality! Thank you for your patience. Thank you for your time. Thank you for explaining things until I understand. Thank you for making me do my best. Thank you for being my teacher and my friend. WORK PERMITS: When you get a work permit EVERY box needs to be filled out on the Intent to Employ form before we will issue you the work permit. If you are trying to get one while we are on spring break you will need to go to the administration building behind the high school. Please remember to check the lost and found located in the Welcome Center if you are missing items. Unclaimed items will be taken to Goodwill if they are not picked up prior to Spring Break. 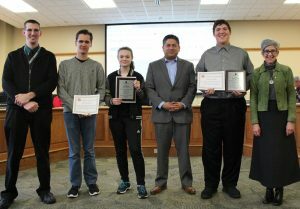 The following students are winners from the Interra RedHawk branch contest: Emma Bickel, Desmond White and Anibal Argueta. Congratulations! Do you have a book to read over spring break? Get to the library today to check one out to read over vacation! Remember, you can also use your eResource card to check out books, movies and music from GPL over break! Seniors: If you still need to order a cap and gown you can visit their web site at www.highschool.herffjones.com to place an order. They will also be here on April 13th during the lunch periods. Cap & Gown delivery day will be on May 2nd during SRT. GHS is offering an athletic physical exam night for GHS students on April 12th from 5:30-7:30 p.m. at the new urgent care center on Elkhart Rd. All students interested MUST sign up for an appointment time in advance with Mrs. Schrock in the GHS athletic office and pay $20 in advance. If you cannot pay the $20, please see Mr. Kissinger for scholarship opportunities. This is a great opportunity to complete your physical exam for the 2017-18 school year. Attention Students and Staff: Key Club is collecting travel-sized soap, shampoo and conditioner for families at Riley Hospital. If you are traveling over Spring Break and have leftover personal items, you may bring them to the guidance office from April 10th through the 13th to be donated. All physical education and fitness classes are bowling this week. Students should be prepared to travel to Maple City Bowl by arriving to class on time with their money and permission slip. Students are expected to meet their teacher in the lobby by the weight room doors. Any students who arrive late must report to the main office. There are new scholarships in Guidance. Please stop by for more information! Seniors who still haven’t filed the FAFSA: Indiana has announced that the state’s March 10th FAFSA deadline will be extended until April 15th this year! The process for families became more complicated this year due to a glitch in the IRS retrieval tool. Students and their families can now go back in to file the FAFSA if they have not done so, or go back in if the tax import tool did not work for them. Take advantage of this second chance to possibly qualify for funds from the State and/or Federal government for college! Don’t miss this new deadline! Come shop for a FREE prom dress! The Junior League of South Bend, Inc. and Ziker Cleaners are partnering together once again to host Princess for a Night. 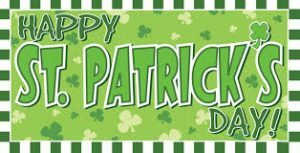 This event takes place at the Century Center in downtown South Bend on Saturday, April 1st from 8:00 a.m. to noon. You are asked to arrive by 11:30 a.m. and please bring your student ID with you to the event. Super Mileage Club will meet TODAY at 7:00 a.m. and 3:40 p.m. The Goshen Band Boosters are hosting a shoe drive through April 9th and would love your help! They’re collecting gently used or new shoes which are then taken to other countries such as Haiti and given to micro-entrepreneurs. The entrepreneurs refurbish the shoes into usable ones or other items of use and sell them to earn an income to help themselves and their families. Take a look in your closets or wherever you may keep your shoes and see if you have a pair or two that you would be willing to donate. You can even donate flip flops. Bins will be placed around the school (as well as the Goshen area) that have a poster on them with the dos and don’ts of what is an acceptable shoe. If you would like more information, or have any questions please feel free to contact Kristy Nissley at nissley1998@gmail.com. There will be a boys soccer call out for next year TODAY during the 2nd session of SRT in the main gym. There will be a call meeting on the upper deck of the main gym for anyone interested in cheerleading on Tuesday, April 11th during the 2nd session of SRT. If you are unable to make the meeting, please contact Coach Eckelbarger or Coach Sloan. The girls JV softball team lost a hard fought game against Jimtown, 17-8. Sara Breniser went three for three while Gabby Ott and Alexis Navarro each added two hits. Navarro also had three RBI’s for the night. The girls varsity softball team lost to Jimtown 10-0 for their first loss of the season. Elkah DeVoe and AnaMaria Ramirez each had the only hits for the night. The boys varsity baseball team defeated Fairfield 11-1. Joey Peebles threw five strong innings allowing only a single run and striking out eight. It was a complete game due to the ten run rule. The offense was led by Will Koshmider who had two hits including a double. Tyler Colpitts, CJ Detweiler, Mike Pinarski, Charlie Collins and Austin Bontrager had doubles as well. Philip Wertz had two singles and Chava Garcia had two RBI’s. The boys JV baseball team opened the 2017 season with a 6-0 victory over Fairfield. Austin Cain led the way for the RedHawks on the mound throwing six innings and striking out ten Falcons. Cain also took a no hitter into the 6th inning where he gave up only one hit on the night. The RedHawks offense was led by Bryce Smith who had three hits and drove in one run while scoring a run. Joseph Good had two hits and scored two runs for the RedHawks. The girls JV and varsity tennis teams will host Bethany at 4:30 p.m. The boys and girls JV and varsity track teams will host Lakeland, West Noble and Bethany at 5:00 p.m. The boys JV baseball team will host Fairfield at 5:00 p.m. The girls varsity softball team will host Westview at 5:00 p.m. The boys varsity baseball team will play at Fairfield at 5:00 p.m.
As Goshen High School prepares to leave on their annual trek to the Florida Keys for Marine Biology this week, we would like to use the opportunity to share a Good of Goshen story with you. 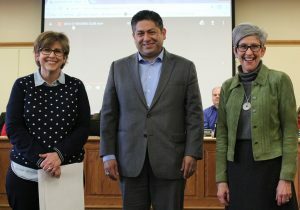 The story illustrates the cooperation and collaboration between Goshen College and Goshen High School, in order to provide exciting educational opportunities for their students. Watch the Goshen Community Schools Twitter and Facebook feeds all during Spring Break for updates on the 2017 GHS Marine Biology Trip. 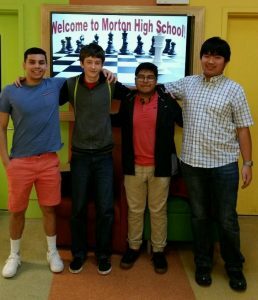 GCS chess teams participated in state chess competition over the weekend. In 12th/Under, Goshen High School had one team, and they finished 17th of 27. Goshen Middle School had two teams in 8th/Under. Our “A” team finished 4th of 35 teams. This was our best result, and was really a very good effort. The match they lost was to the eventual champions, but it was a very good day for them. Our “B” team in that division finished 23rd. The “A” team was Matthew Snyder, Daniel Elizalde, Sam Kreps-Long, and Cole Johnston. In 6th/Under we had 3 teams: Chandler finished 17th of 44, Parkside was 32nd, and Prairie View was 38. Finally, we had 4 teams in 3rd/Under. Parkside just missed a trophy on tiebreaks, finishing 12th of 54, Prairie View was 21st, Chandler was 35th, and Waterford was 37th. Individually, Daniel Elizalde, an 8th grader, had the best results on the day, winning all 5 of his games. Cole Johnston had a good result, too, winning 4 and drawing 1. In the 6th/Under division, Quinn Shreiner Landes (Chandler) won 4 of 5, and Mira Yoder (Parkside) won 5 of 6 in 3rd/Under. Although it may not have been Goshen’s most successful state tournament, it was still a great day. The kids behaved well, they were where they were supposed to be when they needed to be, and the students never caused any problems or disruptions for the team coaches. Thank you to our students for being such great representatives of Goshen Community Schools! Chandler-Evan Hochstedler, Moses Kratzer, Myles McLaughlin, Isaac Moore, Aiden Saner, Cai Saner, Ethan Sharp-Merriman, Quin Shreiner Landes, and Calvin Strader. GHS-Demetrius Gulewicz, Anton Pham, Raul Quiroz, Alan Rivera, and Ryan Schlichter. GMS-Christina Elizalde, Daniel Elizalde, Emre Gulec, Cole Johnston, Samuel Kreps-Long, Joseph McKeage, Logan Miller, Josiah Schlabach, and Matthew Snyder. Parkside-Tinsley Benjamin, Jacob Cottey, Benjamin Fleming, Lucas Kroening, Isaya Magatti, Shemaya Magatti, Roman Nyce, Kendall Scott, Tyler Scott, Kevin Sixtos, and Mira Yoder. Prairie View-Lian Espinosa, Aiden Gill, Jayden Schlabach, Saghan Schlabach, Isaac Stahly, Levi Subera, Noah Subera, and Preston Wright. Waterford-Oliver Kauffman, Ellie Morris, Anson Witmer, and Elijah Witmer. WORK PERMITS: When you get a work permit EVERY box needs to be filled out on the Intent to Employ form before we will issue you the work permit. One Act auditions are TODAY after school in the auditorium. Any and all students are welcome to audition! Seniors: Many scholarships are due by April 1st. If you need them sent in, please get them to Ms. Hollinger in the guidance office by TODAY to make sure that they get out before we leave for spring break. Super Mileage Club will meet TOMORROW at 7:00 a.m. and 3:40 p.m.
Marine Biology seminars will continue to meet on Saturday mornings and Monday evenings until the Marine Biology trip. All Monday evening meetings are from 7:00-9:00 p.m. and all Saturday morning meetings are from 8:00 a.m.-12:00 p.m. Your attendance at these meetings is expected! Conflicts need to be worked out ahead of time. See the Weavers if you have questions. There will be a boys soccer call out for next year TOMORROW during the 2nd session of SRT in the main gym. The girls varsity softball team defeated West Noble 11-1. Ramirez drove in four. Elkah DeVoe, AnaMaria Ramirez and Alexia Nettrouer each had two two hits. Jordan Nemeth hit her 2nd career homerun! Kate Atkinson got the win with eleven strike outs and only gave up four hits. The girls JV softball team defeated West Noble. Gabby Ott had five hits. Ruth Whitehead and Breanna Boocher each had two. Grace Vance got the win with three with seven strike outs. The boys track team had three participants compete on Saturday at the Hoosier State Relays at Indiana University. Competing were Rummel Johnson (High Jump), Brock Tauteris (Shot Put) and Lucas DeMoya (Pole Vault). Senior, Rummel Johnson earned a 7th place finish in the high jump (6’2″) for 1.5 team points for the RedHawks. The top eight each received a medal. The boys varsity baseball team will host Fairfield at 5:00 p.m. The boys JV baseball team will play at Fairfield at 5:00 p.m. The girls JV softball team will host Jimtown at 5:00 p.m. The girls varsity softball team will play at Jimtown at 5:00 p.m. Attention wrestlers: All after school meetings with Coach Pickard this week will be postponed until after spring break. A new sign-up list will be posted. Athletic Physical Night will be on Wednesday, April 12th from 5:30-7:30 p.m. for the 2017-2018 school year. Physicals will take place at a new location which will be Goshen Physicians Family Medicine & Urgent Care (close to Eby Ford) at 2824 Elkhart Road in Goshen. Athletic physicals will be $20. Athletic forms can be picked up in the athletic office. When scheduling your appointment, you must provide your $20 and completed/signed paperwork to Mrs. Schrock or Miss Swain. Appointments will start at 5:30 p.m. and continue in 15 minute increments thereafter. Take advantage of this opportunity to get all athletic paperwork done for the next school year. Academic Super Bowl teams bombarded the competition at Wawasee High School. 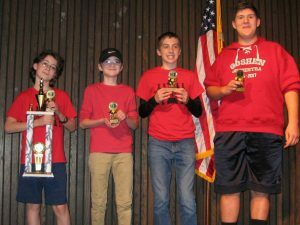 Standouts include mathletes Zach Berg, Chava Garcia, Jacob Grewe and Jacob Haimes. The art team of Kat Antal and Amelia Marrufo also put up a valiant fight. Congrats also goes out to the youngest team, comprised of historians Ebony Jessen, Safia Shakil, Montse Martinez and Walfre Calderon. While they did not place, scientists Abby Margush and Amy Holbrook bravely faced the competition. Attention Students and Staff: Key Club is collecting travel-sized soap, shampoo and conditioner for families at Riley Hospital. If you are traveling over Spring Break and have leftover personal items, you may bring them to the guidance office from April 10th through the 14th to be donated. One Act auditions are Monday March 27th after school in the auditorium. Any and all students are welcome to audition! All physical education and fitness classes are bowling the next three days before Spring Break. Students should be prepared to travel to Maple City Bowl by arriving to class on time with their money and permission slip. Students are expected to meet their teacher in the lobby by the weight room doors. Any students who arrive late must report to the main office. Seniors: Many scholarships are due by April 1st. If you need them sent in, please get them to Ms. Hollinger in the guidance office by Monday, March 27th to make sure that they get out before we leave for spring break. IHSAA Student-Athlete Tip of the Week: What’s your mental state like before a big game or an important test? Are you unsure or afraid to fail? Are you confident? Do you feel prepared? Are you afraid of the potential result? Most athletes, at every level, would tell you that they are a little nervous before that big game. If you don’t have those butterflies in your belly, I would be very surprised. But why are you nervous may determine the end result. If you aren’t prepared, don’t anticipate positive results. But if you are nervous because of the anticipation of the game and you are prepared, you will find yourself confident and ready for the challenge ahead! Join in! TODAY is the last chance to register to win gift cards to fun places, courtesy of the Interra Credit Union RedHawks branch. It’s a great time to celebrate, with spring break in a few days and warmer weather on the way! Stop by the Interra kiosk in the commons where you can get all the details from Ailynn and Tricia. The gift card winners will be announced Monday. Super Mileage Club will meet on March 28th at 7:00 a.m. and 3:40 p.m. There will be a boys soccer call out for next year on Tuesday during the 2nd session of SRT in the main gym. In a total team effort, the Goshen Girls Track Team defeated Elkhart Central 69-63 in their season opener. Top performances included Suzette Rodriguez’s 1st place finish in discus, Kassandra Rodriguez and Suzette Rodriguez’s 2nd and 3rd place finishes in shot put, Kyrah Fletcher’s 1st place finish in the long jump and 2nd place finish in the 100m hurdles, Monse Rodriguez’s 2nd place finish in the high jump, Kayleigh McKee’s 2nd place finish in the pole vault, Jocelyn Valderrama’s 2nd place finish in the 1600 and the 800, Jill Kissinger’s 1st place finish in the 100m hurdles and the 300m hurdles, Remya Johnson’s 1st place finish in the 400 and 2nd place finish in the 100, Alayna Yoder and Brandi Smith’s 2nd and 3rd place finishes in the 200, Ashley Sanchez Gonzalez and Kirsten Graves’ 1st and 2nd place finishes in the 3200, the 4×100 relay’s 1st place finish (Mikayla Burkhead, Alayna Yoder, Brandi Smith, Remya Johnson), and the 4×400 relay’s 1st place finish (Remya Johnson, Jocelyn Valderrama, Alayna Yoder, Jill Kissinger). The girls varsity softball team will host West Noble at 5:00 p.m. The girls JV softball team will travel to West Noble at 5:00 p.m. The boys and girls varsity track and field teams will compete in the HSR Indoor State Meet at 8:00 a.m.
All physical education and fitness classes are bowling the next four days before Spring Break. Students should be prepared to travel to Maple City Bowl by arriving to class on time with their money and permission slip. Students are expected to meet their teacher in the lobby by the weight room doors. Any students who arrive late must report to the main office. You could win gift cards to some of the places you love to hang out just for registering at the Interra Credit Union RedHawks branch. You can enter TOMORROW for a chance to win. Stop by to register and get all the details from Ailynn (pronounced Eileen) and Tricia. Let’s celebrate spring! The girls varsity softball team won their season opener vs. South Bend Washington as Caitlyn Doyle pitched well and only gave up two hits. Ashton Darnell led the offense with two RBI’s. Way to go ladies! The boys and girls JV and varsity track and field teams will host Elkhart Central at 5:00 p.m. Go RedHawks! Calling all supporters of Goshen Community Schools!! We invite you to participate in next month’s Good of Goshen Photo Challenge, during the week of April 17-21, 2017. Please see below for details. We can’t wait to see you chronicle your great RedHawk Pride!! You’re invited to participate in the Good of Goshen Photo Challenge! 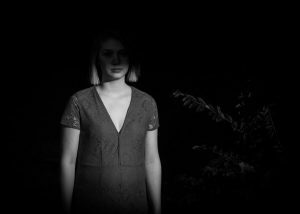 For one week in each month from January to April 2017, you’re invited to submit your own photography that relates to a specific theme. At the end of the week, the photos will be judged by the Good of Goshen team. The winner will get to see their winning photo as the Good of Goshen’s Facebook and Twitter cover photo for an entire month, and will receive a $25 gift card to a local business of their choice! April: #RedHawkPride Contest Dates: April 17 – 21 Let’s gooooo Hawks! 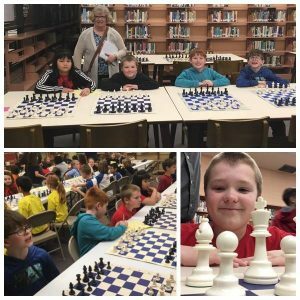 In April, share your photos that relate to Goshen Community Schools. Whether it be at athletic events, school plays, concerts, field trips, or portraits of teachers or students, we invite you to show us your Redhawk pride. Photos must be posted within the contest date range in order to be judged. Participants can post no more than three entries. The winner of each month’s contest will be announced on the Monday following the contest week. 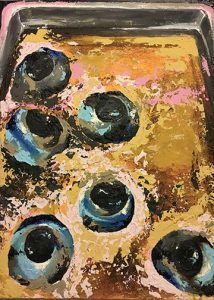 In order to claim their prize, winner must email goodofgoshen@eyedart.com with their choice of gift card. To pick up their prize, winner must come to the Launchpad (above the Goshen Chamber of Commerce) at 234 South Main Street between the hours of 9 a.m. and 5 p.m. Monday through Friday. Winner must present a valid ID for proof of identity. 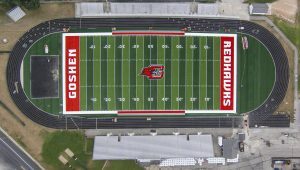 All photos entered will be shared on the Good of Goshen Facebook page at the end of the contest week. Branden Beachy is an amazing photographer, but don’t let him be the automatic winner, GCS. Participate!! Seniors: Many scholarships are due by April 1st. If you need them sent in, please get them to Ms. Hollinger in the guidance office by Monday. March 27th to make sure that they get out before we leave for spring break. You could win gift cards to come of the places you love to hang out just for registering as the Interra Credit Union RedHawks branch. You can enter today and again on Friday for a chance to win. Stop by to register and get all the details from Ailynn (pronounced Eileen) and Tricia. Let’s celebrate spring! Stay In Bounds Ambassadors who make their monthly visits on Tuesdays, remember that is TODAY. You should meet Miss Swain at the welcome center immediately after 2nd period and be prepared to Limbo and play Zoom with Excellence! Join in with the Interra Credit Union RedHawks branch to celebrate the coming of spring AND spring break! You could win gift cards just for visiting the kiosk in the commons to register Wednesday and Friday of this week. Stop by and get all the details from Ailynn (pronounced Eileen) and Tricia. Let’s celebrate spring! Super Mileage Club will meet TODAY and March 28th at 7:00 a.m. and 3:40 p.m. The girls varsity softball team will travel to South Bend Washington High School at 5:30 p.m. Good luck ladies! Colton Holloman competed in the USA Gymnastics sanctioned Indiana State Men’s Championship on Saturday in Charlestown, Indiana and won the Junior Development Men’s All-around, making him the State Champion in his division! Colton placed 1st on the pommel horse and high bar, 2nd on still rings and 3rd on the floor exercise. He has qualified to represent Indiana for the Region 5 Championship in Frankenmuth, Michigan on April 8th. Congratulations Colton! Stay In Bounds Ambassadors who make their monthly visits on Tuesdays, remember that is TOMORROW. You should meet Miss Swain at the welcome center immediately after 2nd period and be prepared to Limbo and play Zoom with Excellence! Congratulations to the Advanced Crimson Jazz Ensemble for a great performance at the ISSMA State Jazz Finals this past weekend! The group was praised for its musicality and versatile performance of difficult music. Congratulations to the Varsity Winter Guard on their incredible season! They finished their season by earning the Bronze Medal at State Finals in Indianapolis on Saturday competing against 16 groups from across the state. Their 3rd place finish is the highest ever for this group. Way to go Winter Guard! Join in with the Interra Credit Union RedHawks branch to celebrate the coming of spring AND spring break! You could win gift cards just for visiting the kiosk in the commons to register Wednesday and Friday. Stop by the Interra RedHawks branch and get all the details from Ailynn (pronounced Eileen) and Tricia. Let’s celebrate spring! Super Mileage Club will meet on March 21st and 28th at 7:00 a.m. and 3:40 p.m. 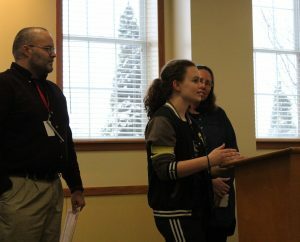 The Goshen High School Art Department has received word that three students have won National Silver Medals for their artwork. Images of their work will be on display at the MET in New York City. In addition, these students can receive recognition for their work in Carnegie Hall on June 8, 2017. Our winning medalists are Isaiah Conder, Paulina Medina and Madi Fry. Congratulations, Isaiah, Paulina, and Madi! The varsity winter guard will compete in IHSCGA state finals TOMORROW at Center Grove High School at 2:37 p.m. They are currently in 2nd place. Wish them luck! Freshmen who are currently in a spring sport and in their first sport of the school year need to report to the cafeteria immediately after school TODAY for the Be the Best program. Do NOT go to the locker room first! You should report directly to the cafeteria and one of your coaches will open the locker room after we are done so that you can change for practice. Join in with the Interra Credit Union RedHawks branch to celebrate the coming of spring AND spring break! You could win gift cards just for visiting the kiosk in the commons to register TODAY as well as March 22nd and 24th. You can enter every day! Stop by the Interra RedHawks branch and get all the details from Ailynn (pronounced Eileen) and Tricia. Let’s celebrate spring! Are you interested in making some spending money this summer? MasterBrand Cabinets is looking for students to work in our production facility. You MUST be at least 18 years old to be eligible for employment. There will be 1st and 2nd shift positions available. First shift hours are 6:00 a.m. to 2:30 p.m. or later in the afternoon. Second shift hours are 3-11:30 p.m. or later at night. Overtime and some Saturday work is a strong possibility. The starting wage is $13.50/hour for 1st shift and $14.50/hour for 2nd shift. If you aren’t planning on pursuing college in the fall, there is potential for full-time employment. If you are interested, please stop into our Human Resources building (1002 Eisenhower Dr. North) or go online to the MasterBrand Cabinets website to fill out an application. IHSAA Student-Athlete Tip of the Week: “The thrill of victory and the agony of defeat” is a saying that’s been around the sports world for a long time. It’s still applicable today and applies to all sports, team or individual. You have all played sports long enough to be on the winning end of an exciting or unexpected victory. The same can be said about that devastating loss. The agony of defeat seems to set in when it happens in your final game. Whether it’s players playing in the NCAA Tournament or your local high school finale, that last loss is one that stays with you a lifetime. While it seems like the end of the world the moment it happens, we all know that it isn’t. Use those disappointing moments to inspire you to move onto bigger and greater things! Adecco Staffing has an immediate need for temporary production support at Zimmer Biomet. Positions require a good work history, a positive attitude and the ability to work in a team environment. You must be 18 to apply. Both full and part time positions are available. This could be a good fit for students graduating this year. Starting pay for general labor is $12/hour. If you would like to learn more about the open positions, please contact April Marban at april.marban@adeccona.com, or at 574-549-6228. The Advanced Crimson Jazz Ensemble will play at 8:10 p.m. TONIGHT at the ISSMA State Jazz Finals. Congratulations and best of luck! Go RedHawks! Tickets for the GHS Musical “CAMELOT” are now on sale. Tickets can be purchased in the choir office. The seating is reserved, so make sure you purchase your tickets with the people you would like to sit with for the show. Ticket prices are $8 for students and $10 for adults. The show is March 16th-19th. All show are at 7:30 p.m. except for the Sunday show which is at 2:30 p.m. Come and enjoy the “Knights of the Round Table” as GHS presents “Camelot”. There will also be tickets available at the door for most performances. Marine Biology seminars began this week and continue on Saturday mornings and Monday evenings until the Marine Biology trip. All Monday evening meetings are from 7:00-9:00 p.m. and all Saturday morning meetings are from 8:00 a.m.-12:00 p.m. Your attendance at these meetings is expected! Conflicts need to be worked out ahead of time. See the Weavers if you have questions. TODAY is a Stay in Bounds Ambassador visit day for all of those ambassadors who normally visit on Thursdays. Please check out with Mr. Kissinger at the welcome center immediately following the end of 2nd period. The varsity winter guard will compete in IHSCGA state finals this Saturday at Center Grove High School. They will perform at 2:37 p.m. They are currently in 2nd place. Wish them luck! Freshmen who are currently in a spring sport and in their first sport of the school year need to report to the cafeteria immediately after school on Friday for the Be the Best program. Do NOT go to the locker room first! You should report directly to the cafeteria and one of your coaches will open the locker room after we are done so that you can change for practice. Join in with the Interra Credit Union RedHawks branch to celebrate the coming of spring AND spring break! You could win gift cards just for visiting the kiosk in the commons to register this Friday as well as March 22nd and 24th. You can enter every day! Stop by the Interra RedHawks branch and get all the details from Ailynn (pronounced Eileen) and Tricia. Let’s celebrate spring! The Advanced Crimson Jazz Ensemble will play at 8:10 p.m. TOMORROW at the ISSMA State Jazz Finals. Congratulations and best of luck! Go RedHawks! The spring parent player meeting for Unified Track & Field, boys golf, girls tennis, softball and baseball will be at 6:30 p.m. in the main gym TODAY. All team members and parent(s) are expected to attend. Boys and girls track & field has already had their parent/player meeting, so they should NOT attend. The Goshen Band Boosters are hosting a shoe drive through April 9th and would love your help! They’re collecting gently used or new shoes which are then taken to other countries such as Haiti and given to micro-entrepreneurs. The entrepreneurs refurbish the shoes into usable ones or other items of use and sell them to earn an income to help themselves and their families. Take a look in your closets or wherever you may keep your shoes and see if you have a pair or two that you would be willing to donate. You can even donate flip flops. Bins will be placed around the school (as well as the Goshen area) that have a poster on them with the dos and don’ts of what is an acceptable shoe. If you would like more information, or have any questions please feel free to contact Kristy Nissley at nissley1998@gmail.com. *** The Band Boosters are doing a Shoe Drive Blitz TODAY from 3:30-9:00 p.m. If you bring a pair of shoes you will get a free Redzone cookie while supplies last. Limit 1 per person. *** Thank you for your help! Our staff has started planning for the GHS graduation, to be held in the GHS main gym on Sunday, June 4th at 2:00 p.m.
We will be issuing tickets for the graduation ceremony. In early May, each graduate will be issued the same number of tickets (5). The tickets will be free of charge, but each person (including babies who will be held during the ceremony) will need to have a ticket in order to get in for graduation. No one will be admitted into the gym for graduation without a ticket. We ask that you please meet your family members to distribute tickets prior to entering the school. We will announce a time for students to pick up their tickets. An ID must be presented to pick up tickets. We will e-mail this information to students as a reminder. If a student does not need all of the tickets that he/she is given, he or she should return the extra tickets to the main office. Tickets may be re-issued to another family if there are special circumstances that cause them to need more than their allotted number of tickets. (Special circumstances will be determined by the Principal.) If your family needs more than the allotted 5 tickets, you should call the Principal’s Secretary to be put on the “extra ticket request” list. Tickets are very limited this year due to the size of the class and the new gymnasium seating, so even extra ticket requests may not be able to be honored. Please have your student check with friends or people in their SRT class to see if they can find someone who does not need all of their tickets. This GMS class project was featured on an ABC57 News “Cool Schools” segment, after the class planned and completed an authentic, engaging genetics project for their New Tech class. Click on the link below to see the news video. Sam explained that her sister has a genetic disorder, so the project was very personal for her. She said that she has been researching Down’s Syndrome, and felt lucky to be able to share some of what she has learned. She hopes that she will get people to “see beyond the genetic disorder, and see the person”. Sam even led a workshop on the topic for her fellow classmates. Donna and her dog “Bo” were recognized for creating excitement and interest in an after-school reading and writing program. Donna runs the group on a volunteer basis, and GMS students may participate if they choose to do so. She shared a video of the program, showing students reading, hanging out with friends, petting the dog, writing, and sharing snacks. She also shared information about how the students’ NWEA test scores grew significantly after participation in the reading program. Those in attendance at the board meeting got to hear audio of each of the impressive arrangements composed by the students. Orchestra director Sean Patrick stated that all GCS students are given an opportunity to compose music, but much of the work has to be done on their own time. The students reported that they spent anywhere from 2 weeks to 2 months working on their compositions. 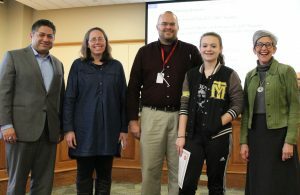 There were four GCS students who entered the competition, and each one won their category. Congratulations, students!